Seven-time Formula One champion hit his head on a rock in a skiing accident in France. GRENOBLE, France — Doctors treating Michael Schumacher refused Monday to predict an outcome for the seven-time Formula One champion, saying they were taking his critical head injury “hour by hour” following a skiing accident. Chief anesthesiologist Jean-Francois Payen told reporters that Schumacher was still in a medically induced coma and doctors were focusing only on his current condition. “We cannot predict the future for Michael Schumacher,” said Payen, who is also in charge of Grenoble University Hospital’s intensive-care unit. Schumacher, the most successful driver in Formula One history, arrived at the Grenoble hospital a day earlier already in a coma and immediately underwent brain surgery. The German driver was skiing with his son Sunday morning in the French Alpine resort of Meribel when he fell and hit the right side of his head on a rock. He was wearing a helmet, but doctors said it was not enough to prevent a serious brain injury. Gerard Saillant, a trauma surgeon who operated on Schumacher when he broke his leg in a 1999 race crash, was at the hospital as a visitor. He told reporters that Schumacher’s age — he turns 45 on Jan. 3 — and his fitness should work in his favor. But the Grenoble medical team was being very cautious about Schumacher’s prognosis. Working to relieve the pressure on his brain, they lowered his body temperature to between 34 and 35 degrees Celsius (93.2 to 95 degrees Fahrenheit) as part of the medically induced coma. The neurology team at Grenoble University Hospital is recognized as among the best in France and the hospital, in a city that is the gateway to the French Alps, sees a large number of skiing accidents every year. Schumacher has been seriously hurt before. He broke his leg in a crash at the Silverstone race course in 1999. He also suffered serious neck and spine injuries after a motorcycling accident in February 2009 in Spain. The area where Schumacher was skiing is part of a web of trails that slice down through a vast and, in parts, very steep snowfield. Although challenging, the snowfield is not extreme skiing. The runs are broad and neatly tended, and the ungroomed area in between, known as off-piste — where the resort said Schumacher was found — is free of trees. The resort said Schumacher was conscious when first responders arrived, although agitated and in shock. But Payen said Monday that after the fall Schumacher was not in a “normal state of consciousness.” He was not responding to questions and his limbs appeared to be moving involuntarily. His wife and other family members were by his bedside. “The family is not doing very well obviously. They are shocked,” said his manager Sabine Kehm, who added that the family still appreciated the outpouring of support. The French prosecutor in Albertville has opened an investigation into the accident, according to the Mountain Gendarmerie in Bourg-Saint-Maurice, which will participate in the probe. The goal is to determine the circumstances of the accident and what was responsible for it. “Like millions of Germans, the chancellor and members of the government were extremely dismayed when they heard about Michael Schumacher’s serious skiing accident,” German Chancellor Angela Merkel’s spokesman, Steffen Seibert, said in Berlin. 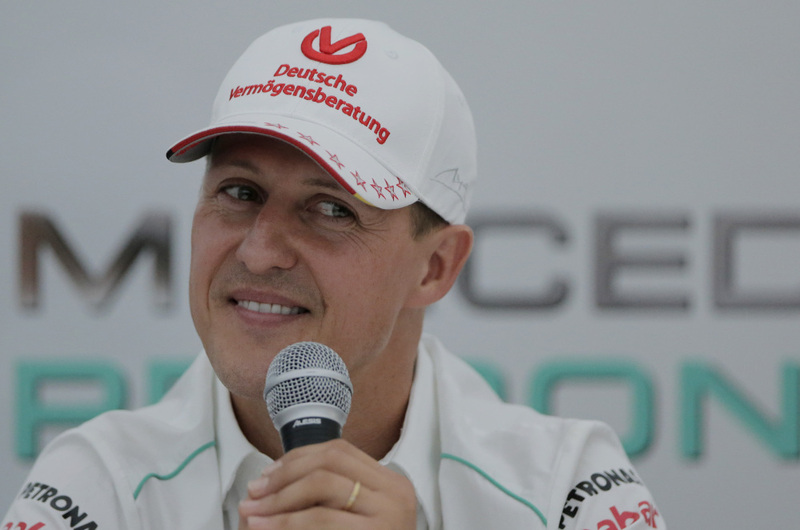 Ferrari, which Schumacher raced for, expressed its concern in a statement. “Everyone at Ferrari has been in a state of anxiety since hearing about Michael Schumacher’s accident,” it said, adding that company president, Luca di Montezemolo, and race team leader, Stefano Domenicali, were in contact with the family. During his career, Schumacher won seven drivers’ championships and 91 race wins. After initial success with the Benetton team, Schumacher moved to Ferrari and helped turn the Italian team into the sport’s dominant force. After initially retiring in 2006, he made a comeback in 2010 and raced for three years with Mercedes. DiLorenzo reported from Paris. Lori Hinnant in Paris, Geir Moulson in Berlin, AP Sports Writer John Leicester in Super-Besse, France, and Deborah Gouffran and Milos Krivokapic in Grenoble contributed to this report.